If your Leadership Team isn’t accountable for the Company’s values then who is? I was shocked recently to learn that the senior executives of an Australian operation in a large international company thought that their company’s values were irrelevant and not worth talking about. This is a perfect example of a business that has gone through the motions to create a set of values but is clearly not doing the work required to have them live throughout the organisation. But more disturbing is that these people hold very senior roles and yet haven’t connected with their responsibility as leaders. 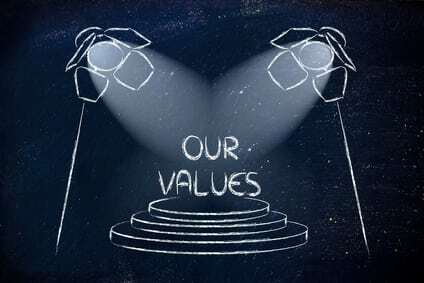 If your leadership team doesn’t own your corporate values then not only will they not exist in your organisation, in the absence of leadership’s commitment something else arises that will have a powerful detrimental impact on performance – cynicism. When your leadership teams are cynical about the company’s commitment to do what they say they are going to do or be who they say they are, your business is in trouble. The first risk is that you will lose valuable people at the top of your organisation, the second is that the cynicism will filter down to employees and will impact morale, the third and most critical is that engagement will be eroded and your business will lose the flexibility and creativity required to meet the challenges of the future and beat your competition. The leaders I heard about recently have obviously experienced a disconnect between what the company espouses and what it does otherwise they wouldn’t be so dismissive. Have they discussed this as a leadership team? Have they raised the issue with the corporate executives? Is there the room to raise it, will it be heard or dismissed? These and many other questions come to my mind. Richard Barrett’s blog on the Barrett Values Centre website is one of many valuable resources for learning more about what’s required of leaders and leadership teams to drive a values-based culture to generate performance. A high performing leadership team stands for the corporate values and, if it can’t, gets to work on creating values it can stand behind 100%. As a leader, if you can’t stand for your company’s values, or you don’t see other’s doing so – who are you going to be about it?